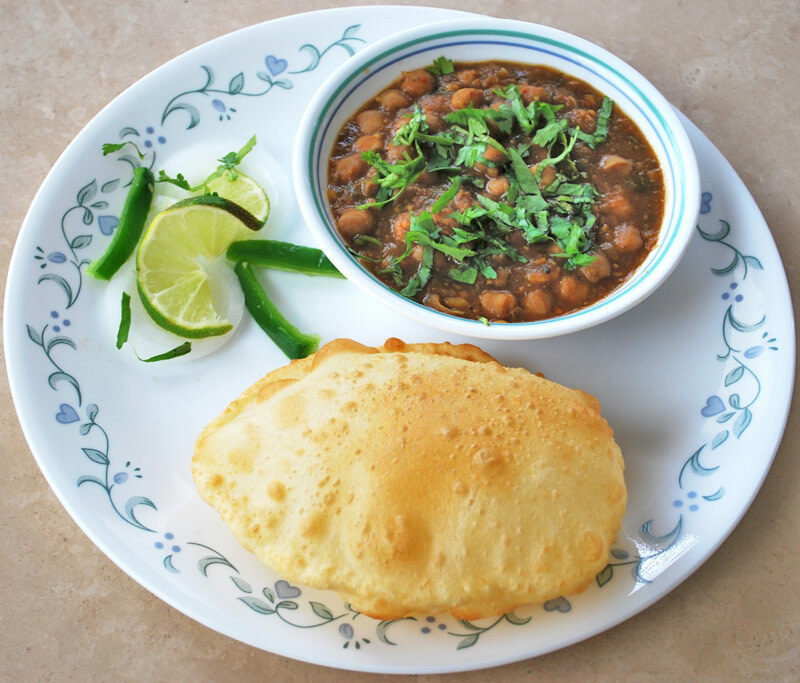 Chole- Bhature is an authentic and tasty dish from north India. It is very famous in an Indian dish. Garbanzo Beans, Chickpeas are a great source of protein and is a very low in calories, and rich in fiber. Chole make with Kabuli chana (garbanzo beans), it can make with onion, garlic and without also. Bhature make with Maida (refined wheat flour). It is delicious and super easy brunch. First, I am telling you how you prepare chole. In a pressure cooker, add soaked chickpea boiled with salt, make one potli with tea leaf and dried amla, add water and cook with high flame after start steaming cook with low flame7-10 minutes. In a pan add oil, add chopped onion, green chilli garlic ginger paste start saute1-2minutes then onion start change golden colour add tomato puree and all the spice (you can use chana masala also, no need spices if you are using chana masala) add black salt cook 2-3 minutes after that add boiled chana and cooked 1-2minute. Chole is ready garnish with ginger Julian’s, green chili and chopped coriander. Stir together Maida, baking powder, soda bicarbonate into a big bowl. Mix yogurt with sugar and salt add flour, knead lightly into soft dough. Knead 2 tbsp. of oil into dough. Cover the dough with muslin cloth for one hour. Divide dough into small portion and roll them into small ball. Heat oil in a kadai (a heavy bottom pan made with iron) and deep fry on high flame till light golden colour come both side. Drain on a towel paper. Serve hot with chole.